Designed primarily for use on touring cars, Michelin are so confident in their MXv4 Plus * that they have given it a 45,000 mile limited warranty, giving you peace of mind that you are buying a tyre meant for the longhaul. Also used for OEM on some BMW touring Vehicles. With low noise emissions and a tread pattern giving an incredibly smooth ride for such a durable tyre, the Michelin Mxv4 also handles great in the wet. Also benefiting from Michelin's patented MaxTouch construction, you can rest assured that the MXV4 wont let you down. 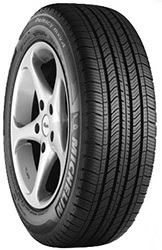 The Michelin MXV4 * is used as original equipment on some BMW vehicles and as such this model carries the official markings on the tyres sidewall to indicate this.